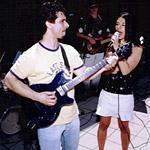 Mike and Miriam Risko have been playing together as an acoustic duo since 1997. They are skilled musicians (guitar and vocals) who can help make a party special by adding acoustic background music at just the right volume. They have a uniquely versatile style and can play many styles of music. Whether you require mellow background music like Norah Jones or Billy Joel or the upbeat sounds of the Indigo Girls, Sheryl Crow or the Beatles, Mike and Miriam's music ads an energy that can make a gathering really special. Their list of material spans all the decades and covers styles like country, rock and pop so they will appeal to all different kinds of guests. In addition, they are known for the simplicity of their music. They are just right for parties, clubs and special events. Also, they can play anywhere from a large ballroom to someone's living room and they are adaptable to almost all kinds of functions from weddings to Bar/Bat Mitzvahs to birthday parties and bridal showers. If you are looking for something different than a party band, hiring an acoustic duo enables you to have live music at a very reasonable rate (with only two people in the band, you'll save lots of money). With an acoustic duo you can expect that your guests will be able to carry on conversations while hearing the music at a good volume, in the background. You can also expect a much more memorable event if you have live music playing. The best kind of party is a party where there is good food, good friends and great music. 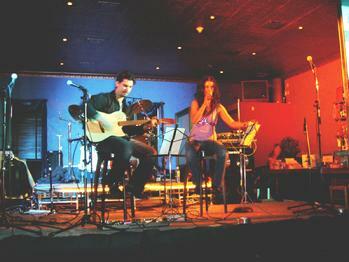 In addition, you can hire an acoustic trio consisting of Mike, Miriam and a bass player. Contact us for a sample set list and for a free consultation. Mike, Miriam and Larry appear at Club Fit in Jefferson Valley during their food and wine tasting event in November 2007. Mike and Miriam at Vintage in White Plains in march of 2006.